You are probably aware that last week two members of the Secret Service’s K-9 unit thwarted a would-be White House intruder. 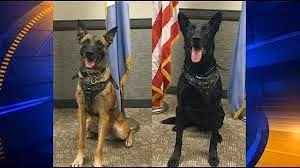 Considering all of the recent bungling by the Secret Service and the understandable bad publicity that went along with it, the Service was thrilled that these K-9 Secret Service members were successful. Unfortunately, they were so thrilled that they created an enormous breach of security for the dogs involved. Not only did they make the foolish mistake of giving out the dogs’ names – Jordan and Hurricane – but they committed the big no-no of publishing photographs of these heroic agents. (The pictures, by the way, were published on Twitter. If anyone can tell me why the Secret Service has a Twitter account, I’d love to hear from you). Since making the blunder of identifying the dogs, the Service has been wise enough to avoid publishing whether they had to go into hiding, and if so, where they are now relocated. However, I’m sure TMZ has its people following a telltale trail of Alpo. Patriotic pups are nothing new in the United States. In fact, one of these Belgian Malinois accompanied members of the Navy SEALs on the historic raid on Osama bin Laden. These dogs are quick learners and obviously much cheaper to train and feed than their human counterparts. Originally, they were used almost exclusively to sniff out bombs, but as people became more aware of their skills, they’ve been given other jobs. An all-dog Congress would be much more inclusive than the present one. Every breed of dog, all colors and backgrounds would be equally welcome. These Congressdogs would not take advantage of their position by using all kinds of perks. A dog doesn’t care if he flies first class on a junket to Paris. When was the last time a growly Senator got happy if someone just tossed him a tennis ball? Dogs are known for their loyalty, so they would be committed to their owners who sent them to Washington, not to some rich favor seekers they never even met. If you are worried about these dogs slobbering all over the place, once again I refer you to the current members of Congress. Okay, okay. I got carried away. Obviously, it’s ludicrous to think that 535 dogs could be trained to take the place of our human Congress. Then again, we’d need only nine for the Supreme Court.